Lithium-ion batteries may not be the dominant storage technology for too much longer. While lithium-ion batteries are undergoing an historic scale-up, researchers are also hard at work looking for what battery technology might come next. A big battery breakthrough could lead to electric cars that could drive longer on a single charge and are safer to operate. Better batteries for the grid could store more energy, enabling the deployment of more wind and solar. “There’s a worldwide race for these kinds of concepts,” said Paul Albertus, program director for ARPA-E, the Department of Energy program that focuses on early-stage, potentially big-impact energy research. 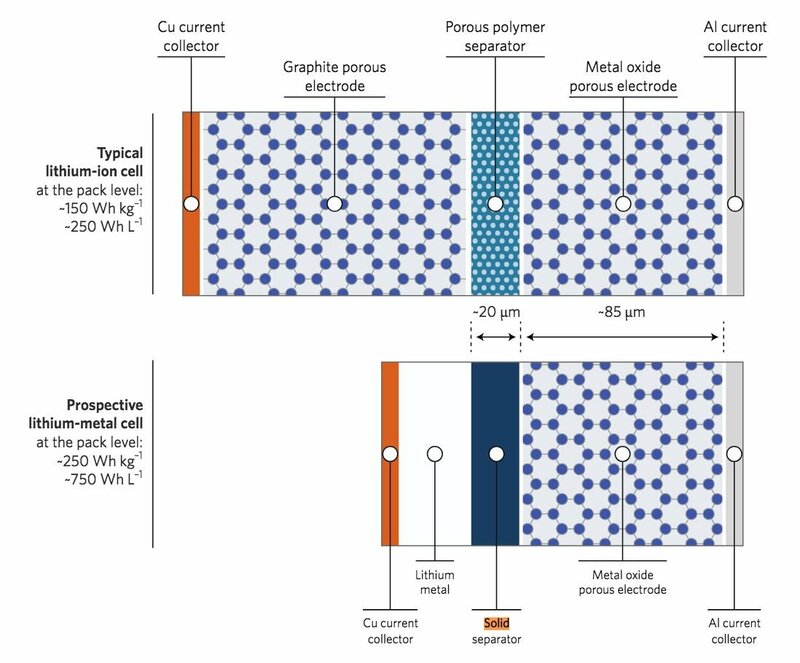 Last month, Albertus and his ARPA-E colleague Sue Babinec published an article in Nature Energy that examined the state of research -- and the challenges ahead -- for the lithium metal battery. The lithium metal battery, as its name suggests, uses lithium metal for the negative electrode part of the battery. A battery has negative and positive electrodes that shuttle ions back and forth through an electrolyte when charging and discharging. Graphite is commonly used for the negative electrode in today’s lithium-ion batteries. But by replacing that graphite with lithium metal, a battery cell could store a third more energy. According to the Nature article, a lithium metal electrode could increase a lithium battery cell’s specific energy by 35 percent and energy density by 50 percent. That could result in a battery cell that could deliver 350 or 400 watt-hours per kilogram, and 1,000 watt-hours per liter. Current lithium-ion battery packs have specific energy of around 150 watt-hours per kilogram and energy density closer to 250 watt-hours per liter. The DOE has a goal to find energy storage options for electric-vehicle battery packs at 235 watt-hours per kilogram and 500 watt-hours per liter. In recent years the ARPA-E program launched an energy storage program called IONICS that doles out grants for early-stage research in areas like the lithium metal electrode. Entities using ARPA-E grants to work on the lithium metal electrode include 24M, Ionic Materials, PolyPlus Battery Company and Iowa State University. Albertus and Babinec write that the lithium metal electrode, combined with research attempting to make a battery cell’s electrolyte out of solid materials (instead of liquid), could one day lead to a successor to the lithium-ion battery. The solid electrolyte would make the battery less flammable, and safer to operate. It’s not easy to achieve a battery breakthrough, however. Scientists across the globe have been working since the 1960s on the lithium metal electrode, with research underway at big battery conglomerates, government labs and startups. 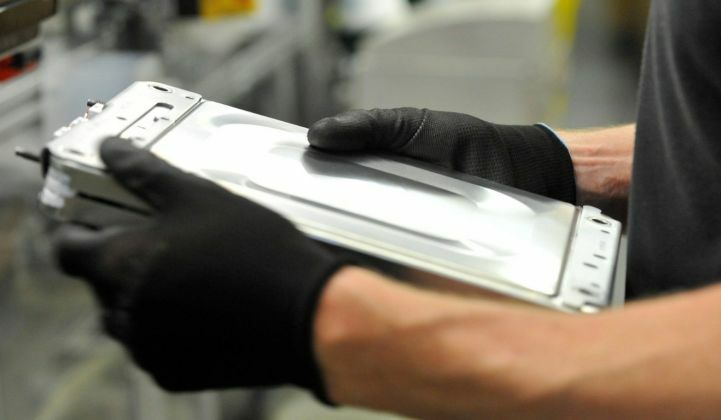 The Renault-Nissan-Mitsubishi Alliance last week announced a strategic investment in Ionic Materials with the hope of developing the next generation of EV batteries. Solid-state batteries are the holy grail for EVs because of their high energy density and improved thermal performance. Toyota, Fisker and others are looking to unleash the potential of solid-state batteries too. There are some small lithium metal batteries that are used in niche applications in the medical industry, but no one has yet been able to scale up the batteries to the point where they can power a car or hold energy for a solar farm and sell them commercially. In the Nature article, the authors highlight the parameters battery researchers should focus on when working on these types of projects. They also point out methods that would avoid false positives and eliminate what are called “dendrites,” or whisker-like forms of lithium that can grow inside batteries and cause problems. In particular, Albertus and Babinec found that with the right low-cost parts, lithium metal electrode battery cells could reach a cost of $100 per kilowatt-hour. Keeping the cost low -- below that of lithium-ion batteries -- would be the key to a new battery successor. Albertus said that unlike some battery technology that could be just a few years from being widely adopted, such as using silicon for a lithium-ion battery anode, the lithium metal battery could be a decade away. “You can’t schedule breakthroughs,” Albertus added.